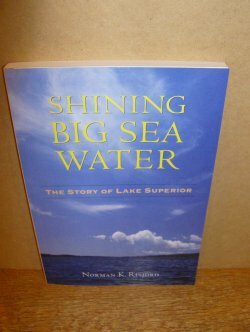 In "Shining Big Sea Water", historian Norman K Risjord offers a grand tour of Lake Superior's remarkable history, taking readers through the centuries and into the lives of those who have travelled the lake and inhabited its shores. Through lively, informative chapters, Risjord begins with the lake's cataclysmic geological birth, then explores the lives of native peoples along the shore before European contact and during the fur trade, showing how Superior functioned as an unusual "blue water highway" for Indians, early explorers, industries, and settlers. He outlines the development of such cities as Sault Ste.Marie, Michigan; Ashland, Wisconsin; and Two Harbors, Minnesota, and tells the fascinating histories of life-saving lighthouses and famous shipwrecks. In the final chapter, Risjord looks to the future, offering a clear-eyed account of the environmental and economic challenges faced by America's largest freshwater lake. Interspersed throughout the book are handy tips for travelers, highlighting historically significant sites that illustrate key pieces of Lake Superior's natural and human history, including national lakeshores, in the United States and provincial parks in Canada.178pp.